* Photo gallery – more than 700 snapshots! SOUTHERN PINES — Pat Moss understands that for his team to get better, they have to play better competition. In that case, his AC Rocks U-12 travel soccer club should be pretty good. 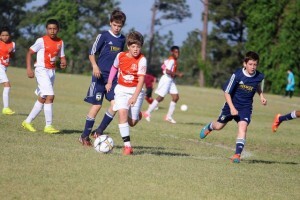 That’s because the team opened up its Summer Starter tournament on Saturday at the Morganton Road Sports Complex in Southern Pines with a 7-0 loss to Triangle Football Club Alliance. The Raleigh-based team is ranked No. 2 in the state, Moss said. AC Rocks players were outplayed, outmaneuvered and out-hustled — and that was just the first half. Down 3-0, Moss challenged his players to “win the half” against these taller, faster athletes. The encouragement didn’t work, and while Triangle players talked with each other, passed the ball and moved the ball up the field, AC Rocks didn’t respond. It was the first time a Moss-coached team failed to offer a single shot on goal. Meanwhile, AC Rocks goalies Robert Potter and Noah Aiken faced a barrage of fire from Triangle FCA. “We have some bright spots,” Moss said. It was the first time AC Rocks played on a normal-sized soccer pitch, measuring 100 yards by 50 yards, instead of the more familiar 80 yards by 40 yards. It’s also the first time the team has played 11-on-11 instead of 8-on-8. The game play is quite different, Moss said. Moss called the in-game lesson “baptism by fire,” but there’s plenty of reason to expect more from AC Rocks players in the near future. The five-team U-12 tournament continues on Sunday in Southern Pines. AC Rocks won its second game, 4-2, and advanced to the semifinals. In early March, the team earned its first tournament championship while playing in Mooresville. In the Race City Classic, AC Rocks beat the Lake Norman-based LNSC University Vipers, 5-1, before whipping up on the JUSA Strikers, from Clayton, 7-2. 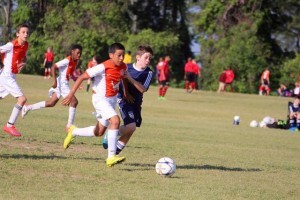 The semifinal match against CUFC Everton, of Charlotte, wasn’t as easy. There, AC Rocks won 2-0. In the championship game against the CR White Rapids, from Cornelius, AC Rocks eked out a 3-0 in overtime. The game ended in a shootout. Noah Aiken, Joey Nicholson and Trevor Moss scored for AC Rocks in the shootout.